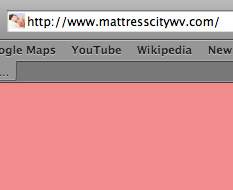 Mattress City is a family operated retail store at the University Town Centre in Morgantown, WV. They pride themselves on their customer service and great selection, and have great deals on the latest models from the top brands. They came to me looking for a small, brochure-style website that could be updated easily. They wanted the site to have a calming effect on the viewer, so I decided to turn the site inself into comfortable bed. I used warm, soft colors that were similar to the tones the company had been using in their print ads, and used a simple database controller to give them access to any of the textual content on the website. 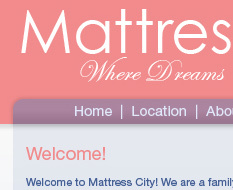 The site is still live and can be viewed at www.mattresscitywv.com.